South African John-Lee Augustyn, who took a break from professional bicycle racing to recover fully from hip surgery, has begun his comeback in his home country and will line up at the Bridge Cape Pioneer Trek international mountain bike stage race on Sunday. The former Barloworld and Sky rider has teamed up with multiple South African women’s road champion and Athens Olympian, Anriette Schoeman, in the mixed category to tackle the tough seven-day 550-kilometre race. The pair will race as Team TREAD/32GI. During his racing career, Augustyn started all three of road cycling’s Grand Tours - Tour of Italy, Tour de France and Tour of Spain. At the age of 21, racing for Team Barloworld, he finished 45th in the 2008 Tour de France, showing moments of brilliance on some of the race’s biggest climbs, signaling the promise of a great career. Augustyn then raced for Team Sky in 2010 and 2011, but a crash in the 2007 Tour of Portugal, which saw Augustyn break the very top of his femur, where it joins the hip, began to hinder him, eventually reaching a point where he required hip resurfacing surgery in 2011. He tried to return to racing in 2012, but realised he needed a longer recovery period and took an indefinite break. Augustyn and his Italian wife, Greta Tonoli have been living in Adro, near Milan, where Greta is a fashion designer. Augustyn has been training in Italy since June in an effort to regain his best form and secure a professional road team contract for 2014. “I’ve been training consistently for the past four months and am happy to report that I have had no injury or health problems. The longer recovery period worked out well, but now I’m itching to get back into the racing scene,” said Augustyn. 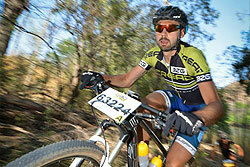 Augustyn finished fourth at the MTN Crater Cruise on Saturday, a 103km mountain bike marathon in South Africa’s Free State province. He was the main protagonist in the race, which attracted South Africa’s top marathon racers, also claiming the King of the Mountain’s prize. “It felt good to go hard again. I didn’t have any team support and misjudged the hot, dry conditions so ran short on fluids and suffered in the last 10 kays, but I’m definitely feeling like the old me again and just need some race-conditioning now,” smiled Augustyn. “It’s crazy that one of the most talented bicycle racers ever to come out of South Africa is toiling away on the roads and trails of Italy far from any kind of spotlight, especially when he’s ready to begin racing at the top level again,” said Sean Badenhorst, editor of TREAD magazine, who arranged for Augustyn’s return to South Africa. “Sure, he won’t be winning the Cape Pioneer Trek, but he’ll be gaining all important confidence and exposure. John-Lee and the late Burry Stander raced head-to-head as youngsters on both road and mountain bikes, raising the overall standard of South African racing as they grew up. We’ve lost Burry, but we must appreciate and support John-Lee, who many believe still has his best racing years ahead of him,” added Badenhorst. Other potential podium contenders on the Bridge Cape Pioneer Trek Mixed Category start list are the 2012 winners, Jennie Stenerhag, a former Swedish national road champion, and Craig Gerber (Asrin Cycling 2); Nizaam Esa and 2011 women’s Cape Pioneer Trek champion, Catherine Williamson (Asrin Cycling 3); and Gerhard Ebersohn and Christine Janse van Rensburg (Peptosport). Also lining up in the Mixed division is former South African marathon champion, Cherise Stander, the widow of Burry Stander, and her father, Andre Taylor, in the iride4burry team. A new species of hominid, Australopithecus sediba, almost two million years old, was discovered in the Cradle of Humankind World Heritage Site, 40 kilometres from Johannesburg, South Africa in 2010.